China South America: Eurocup 2008 - Spain emerges victorious after years of historical "under-achievement"
Eurocup 2008 - Spain emerges victorious after years of historical "under-achievement"
Spain advances to the semi-finals in Eurocup 2008, after years of "La Madre Patria'' (the mother country), entering international championships with world quality and internationally top ranked teams... yet always falling short of expectations. Hopefully the Spanish economy can make such a come back, as my last post indicates, their position in Latin America has grown in the past years and their FDI is crucial-- especially to countries like Cuba and even Peru and Argentina which few can deny are dominated by Spanish banks, telecommunications and construction. Perhaps "dominated"is not the correct term, but rather, lets me describe it as Spain's growing market presence in Latin America is significant and growing. Peruvians, despite many expressing their anger over Fujimori's government signing of what many consider monopolistic rights to Telefonica of Spain, realize Spain is an important partner in the international community. Telefonica did come to control the majority of the Peru's telecom sector, and they do charge very high prices for their services in Peru, Spain no less is a important source of FDI, in addition to China, the US, and Europe as a whole. The United States re-placing Spain as the "imperial power'' or ''empire.'' Today, as of 2008, I believe it is fair to say the failures of the neo-liberal reforms of the 90's in Latin America. Combined then with the fact the Bush administration in the US has largely ignored Latin America for the past 8 years, has greatly helped Spain's image in Latin America, along with China, India, Europe and other countries around the world. Spain, however, is a unique partner in the fact, much like Britain, the countries of Latin America have inherited certain traits and characteristics from the ''mother country.'' Second, Spain recently grown quite wealthy in a short period of time, they are in a position more than ever to invest, initiate cooperation and work with Latin America towards helping each other-- in economic, political and cultural respects. 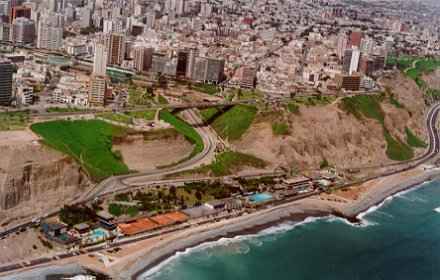 Miraflores,Lima. The trendy/modern district. Symbolic of Peru's recent economic growth.